General Cigar is proud to present Macanudo Vintage 2006, a phenomenal cigar showcasing only the most refined Connecticut Shade wrapper leaves from the 2006 crop. More than 30 years ago, General Cigar created its first Macanudo Vintage cigar to spotlight an exceptional wrapper developed in part by Mother Nature herself. Today, guided by meticulous aging and precise maturation techniques which have been handed down throughout the years, the Vintage tradition continues with the release of Macanudo Vintage 2006. “The Vintage 2006 Connecticut Shade wrapper was cultivated under perfect weather conditions. Ideal sun, rainfall and temperatures yielded an extraordinary crop of shade tobacco that is beautiful to see, and even better to smoke,” said Bill Chilian, director of marketing for Macanudo. A strikingly lustrous golden wrapper takes center stage in Macanudo Vintage 2006. Imparting a wonderfully balanced and complex flavor which is punctuated by the traditional Vintage blend, Macanudo Vintage 2006 will debut with just two frontmarks, as dictated by the leaves themselves. Construction and Appearance: The Macanudo Vintage 2006 Robusto that is going to be used for the full release will have a metal band near the cap and a foot band. The Vintage 2006 will have the same presentation as the Macanudo Vintage 97 Maduro selections, boxed in 12-count Cabinets. This sample smoked for review only had a very simple black and white band. You can see the difference between the two below. The wrapper of the Macanudo Vintage 2006 Robusto is a light golden brown with almost no veins at all and a nice oil to it. The wrapper is extremely attractive and smooth to the touch. 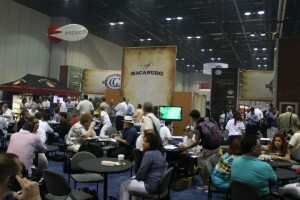 Flavor and Notes: The wrapper of the Macanudo Vintage 2006 Robusto has notes of sweet light hay and blonde roast coffee. The foot has the scent of cream, coffee, hay, and sweet grass. I use a straight cut to prepare smoking the Macanudo Vintage 2006 Robusto. The cold draw has flavors of sweet grass, cream, and coffee. Smoking Characteristics: The Macanudo Vintage 2006 Robusto kicks off with a very light bitter taste close to coffee beans, with some sweet nutty flavors and grass. The draw starts out easy, providing a full body of smooth, creamy, rich smoke. After the first few puffs the bitter flavor fades out and there are notes of cream, nuts, grass, and a light vanilla flavor. The overall tone of the cigar becomes slightly sweet and very enjoyable. Smoke continues to ooze from the cigar between draws, it is definitely the type of stick where people around you can tell you are smoking pronounced and distinct. The ash holds firm, easily past the inch mark, and the burn is fairly sharp. Into the second third, the flavors build become a bit richer. The notes of nuts, sweet grass, light coffee, and vanilla all remain. The draw is still excellent and easily provides a full body of the extremely rich smoke. The strength is, without a doubt, in the mild range. When retorhaling, there is almost no burn or spice at all in the nose. The ash is still holding very well, but the burn has required one correction at this point. During the final third of the Macanudo Vintage 2006 Robusto, there is no more evolution to the flavor profile. All the notes of nuts, sweet grass, light coffee, and vanilla remain. The construction is performing amply, the ash holds firm, draw is excellent, and the burn has evened out. 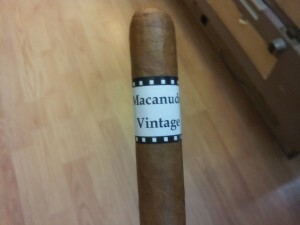 The Macanudo Vintage 2006 Robusto smokes cool to the nub without pulling any heat. 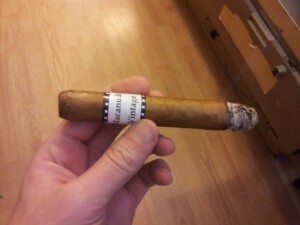 Conclusion: The Macanudo Vintage 2006 Robusto was a very enjoyable mild cigar. Although, this not typically my wheelhouse. Normally, I don’t smoke many Connecticut shade cigars, but on a Sunday morning while reading the paper and sipping on a latte, this cigar is the perfect fit. I could see the Macanudo Vintage 2006 making into that rotation. If you are a mild cigar smoker, I could see this being your new go to. Brass tacks, is it box worthy? If you like mild, without a doubt. I've only smoked a couple of CT Shade cigars that I would smoke again, not really my forte either, however the Alec Bradley Maxx CT had so much going on it would be worth having a few in the humidor! In my opinion, the Vintage 97 Maduro is a twist on the regular Macanudo Maduro line. This new Vintage 2006 is a similar twist on the Macanudo Cafe line. 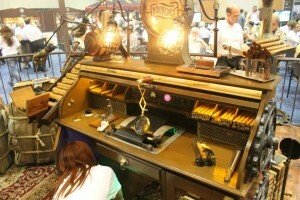 It is enjoyable for what it is and the quality of the tobacco shows.